This blog post documents the Underpinnings Museum Twitter Conference presentation by Lucy Jane Santos, entitled The Curious History of Radioactive Corsets. This presentation will look at the surprising use of radioactive materials in corsetry in the 1920s-1930s specifically looking at two companies (one based in the UK and one in France) that made these – apparently best-selling products. Over 12 tweets it will look at how they worked, what benefits they were said to impart and where they could be purchased. This presentation will be illustrated by advertisements of the products. Lucy Jane Santos is an expert in the history of twentieth century leisure, health and beauty with a special interest (some might say obsession) for radioactivity. She is currently reading for her PhD (due for completion in 2019) on the use of radioactivity in beauty products. She has a BA in Egyptian Archaeology (UCL), an MA in Arts and Museum Management (University of Greenwich) and an MRes in History (University of Goldsmiths). 4 #UPMTC this corset was first patented in Paris in 1937 and the rights to manufacture the design – certified to contain radioactive materials – were bought by Otto Lobbenberg, part owner of the newly formed Corsets Silhouette Ltd, London. 8 #UPMTC Silhouette mirrored other companies at the time emphasising the slenderising effect for the wearer. But the radioactivity also gave the added bonus of allowing them to claim its rejuvenation qualities and power to revive fatigue. 9 #UPMTC It wasn’t unusual in the early twentieth century for unlikely products to be impregnated with either radium or other radioactive materials and it was considered to be very beneficial. Radioactive beauty products especially were widely available and were very popular. 11 #UPMTC The Radiante was short lived as Silhouette found it hard to get the raw materials and the start of WW2 saw them ordered to switch production to help the war effort by producing utility goods and making underwear for the W.A.A.F, A.T.S, and the W.R.N.S. The header image for this post is of a (non-radioactive!) 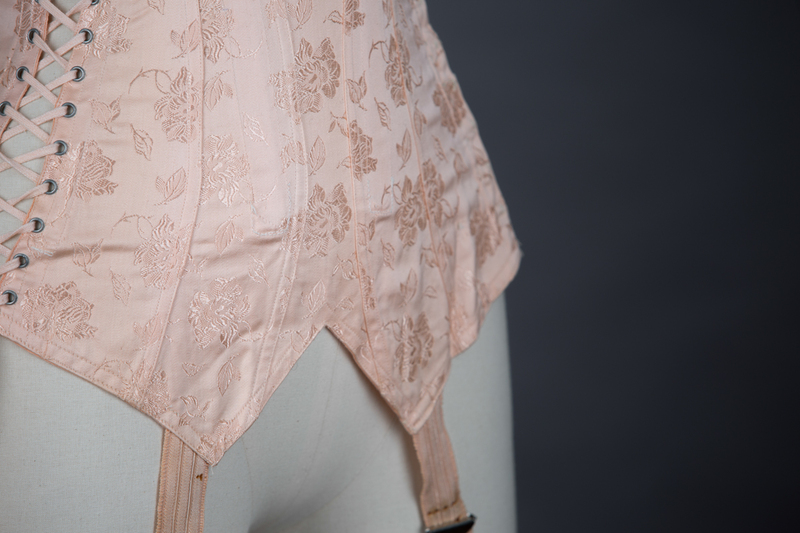 tea rose brocade coutil girdle with side lacing (c. 1940s), from the Underpinnings Museum collections. Photography by Tigz Rice. Full listing coming soon.